Toeboards help prevent people from slipping and falling into holes or off of raised surfaces by creating a raised edge that prevents workers from slipping. OSHA guidelines for toeboards create workplace regulations when toeboards are necessary that employers must follow to help prevent work-related injuries. OSHA guildelines for toeboards say that ladderway floor openings should have toeboards on exposed sides of the openings, except for the opening entrance. Floor hatchways and chutes should have toeboards guarding their exposed sides. They can have up to two sides with removable railings and toeboards as guards, and all other open sides should have permanent railings and toeboards. Workers can take away the removable railings and toeboards when using the hatchway, but they should stay in place when nobody is using the opening. Some types of wall holes require toeboards, according to OSHA guidelines. Wall holes that start less than four inches above the floor and with a hole edge more than five feet above a lower level on the other side of the hole should have toeboards or screens guarding them. 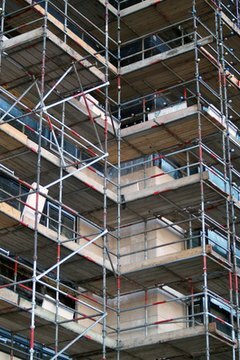 Most scaffolding more than 10 feet off the ground should have toeboards at least four inches high on all open sides of the scaffolding, according to OSHA guidelines. Ship scaffolding, however, can have three-quarter inch by one-and-a-half inch edges rather than standard four-inch toeboards. When workers must pass underneath scaffolding or another temporary platform, the scaffolding or platform must have toeboards and guardrails with screens stretched between them to prevent things from falling on workers below. If workers just work near the scaffold but not under it, OSHA guidelines allow just a toeboard with no screen to protect them from falling objects. OSHA guidelines also require screens between toeboards and guardrails when workers pile things on scaffolding higher than the toeboard height. In some cases, toeboards create a tripping hazard rather than increasing worker safety. OSHA guidelines allow employers to forgo toeboards on scaffolding access points, such as the tops of ladders, as long as there is no danger of objects falling from the access points. Chinn, Lisa. "OSHA Guidelines for Toeboards." , https://legalbeagle.com/6800525-osha-guidelines-toeboards.html. Accessed 20 April 2019.